On 8 May 2018, the Ministry of Health of the Democratic Republic of the Congo notified WHO of 2 lab-confirmed cases of Ebola virus disease occurring in Bikoro health zone, Equator Province. Cases have also been reported in nearby Iboko and Mbandaka. The number of cases is updated regularly by health authorities and WHO. There are now better tools to combat Ebola; however, access is extremely difficult due to the remoteness of the affected area. WHO assesses the risk of national spread to be very high due to the geographical extent of the outbreak, the appearance of confirmed cases in an urban area, the proximity to the Congo River (a major transport route) and the infection of health-care workers. WHO and the International Organization for Migration (IOM) are coordinating cross-border surveillance at points of entry. Exit screening measures are in place at airports in the Democratic Republic of the Congo and at river ports on the Congo River. 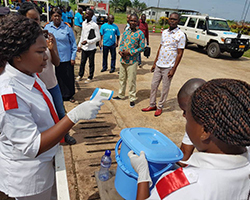 Nine neighbouring countries at high risk of Ebola spread are enhancing their preparedness in line with the International Health Regulations (IHR) (2005). WHO is supporting them with equipment, personnel and training. Based on available information, WHO does not recommend any restriction of travel and trade to the Democratic Republic of the Congo.